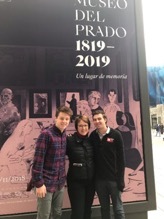 Ben Kiesel ’20 – As I spent an unforgettable semester in Valencia, Spain, I had the opportunity to visit a number of beautiful European cities to study art thanks to the Givens family. I was enrolled in a special topics Pablo Picasso class and though we studied major art movements throughout the 20thcentury, the course focused on arguably the most prolific and creative Spanish artist ever, Pablo Picasso. Picasso had an unmatched influence on movements such as surrealism, neoclassicism, impressionism and cubism. My first trip was to Spain’s capital, Madrid, where I visited two museums, the Prado and the Reina Sofia. I first visited the Prado where I found some of the premier works of art by artists from all of Europe. These works include Las Meninas, The Third of May 1808, Garden of Earthly Delightsand Saturn. It was incredible to be studying these paintings in class one day and seeing them in person the next. While the Prado had many beautiful works, I was most excited to visit the Reina Sofia. The Reina Sofia is home to Guernica, my favorite painting by Picasso. It was incredible to see this masterpiece, and so many others in person. I had heard beforehand that Guernica is much bigger in person than you will think and this proved to be true. I marveled at the way Picasso was able to pack so many complex themes and imagery into one painting. For me, given how much I have studied this particular painting it was surreal to be able to study it in person. I stayed in Spain for my next trip as well, and made my first visit to Barcelona and the northern region of Spain. Along with many amazing sites, such as the Sagrada Familia, Park Güell and La Rambla, I visited the Picasso museum which was a remarkable experience. This particular museum was great to visit in conjunction with my class because we could see progression of different styles throughout his life. Picasso’s ability to create works that bridged the gaps between different styles was evident when you could see many of his works together side by side. For this reason, I think my trip to the Picasso museum and Barcelona in general was the most informative. My next trip was probably my favorite and would not have been possible without the support of the Givens family. I made the trip to central Europe to visit Switzerland. There, I spent about two and a half days in Geneva visiting a variety of sites including the United Nations building, St. Pierre Cathedral and Flower Clock. Additionally, although this is not directly applicable to Picasso and art, I visited the International Museum of the Red Cross and Red Crescent. This museum may have been my favorite just because going into it I really had no idea what the Red Cross and Red Crescent organization actually does. It was extremely informative and had a number of fascinating interactive activities. Once again, though it was not connected with my class, the ability to explore this museum and learn was only possible because I was given funds to visit Lucerne Switzerland to visit the Rosengart Collection. The Rosengart Collection is a collection of many works by Picasso and other 20thcentury artists. I particularly enjoyed one painting by Picasso that is not among his most famous, but one that we studied in class, Still Life.